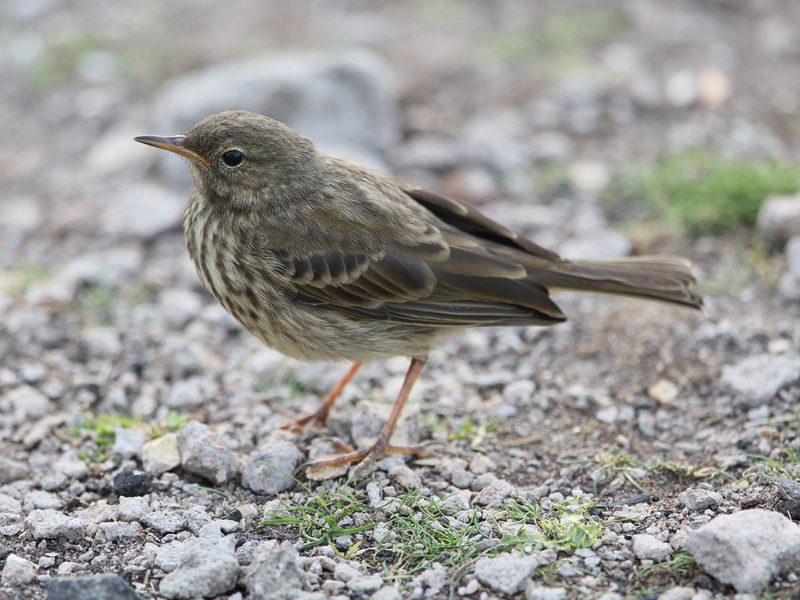 BIRDMAD: A WEEK ON THE IOM (not the Isle of Man) - July 2013. A WEEK ON THE IOM (not the Isle of Man) - July 2013. My friend Dave suggested the visit as he had spent a week there in March last year. 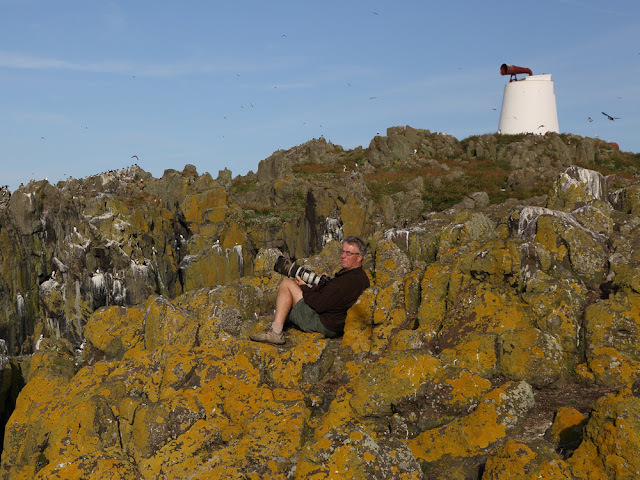 He was quite taken with it and suggested we go there in early July when the puffins, terns, guillemots, razorbills, etc. would be feeding their chicks and photo opportunities would be many. Dave, you may recall from my post about the Gambia in November last, was the chap I met under a tree on a sewage farm in Kotu, Gambia. We planned the trip long in advance and I booked the train to Edinburgh. Dave was driving from North Wales and would pick me up at the station. We would stay at his friend’s house and take the RIB to the Isle of May the next morning. After some last-minute shopping, we headed off to the house of Rob (Dave’s friend) and spent a very enjoyable evening, ending with a walk to the local pub where Andy Murray was just finishing his semi-final match. There was general rejoicing when he won (Andy Murray being Scottish and we being in Scotland). Another round! On Saturday, 6 July, we drove to Anstruther, met the 3 volunteer workers and loaded the RIB with all manner of tools, materials and food. 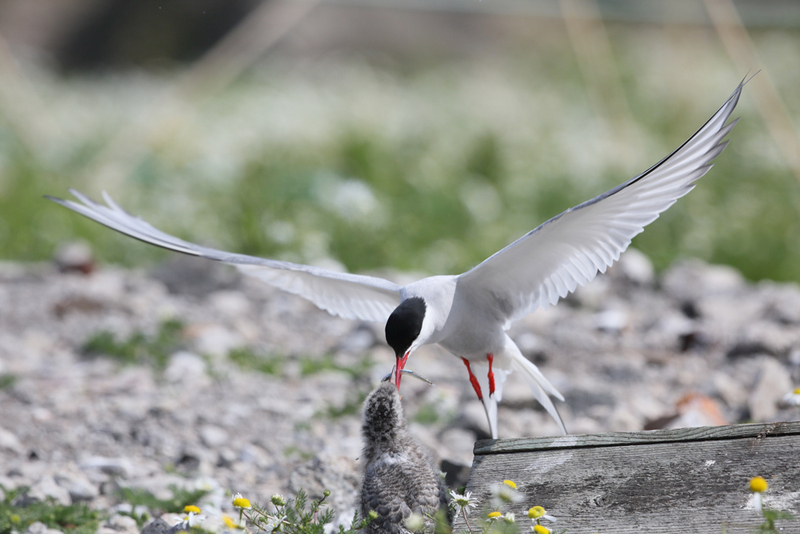 Soon we arrived on the island and immediately ran the gauntlet of the arctic tern colony. Terns dive-bombed us until we got far enough from their nests and chicks. 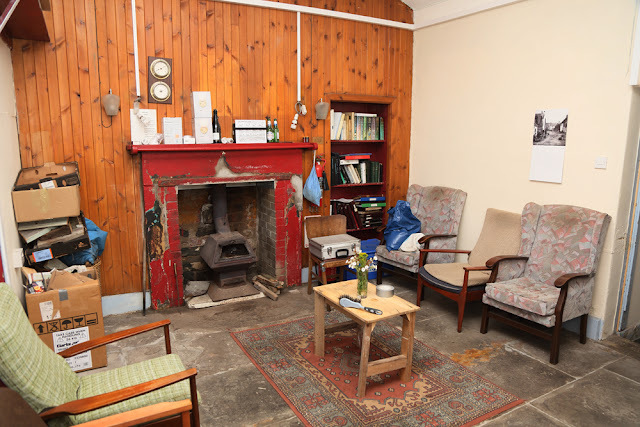 We were spending the week in the 'Low Light', a disused lighthouse from days gone by, with attached accommodation. The 3 volunteers, Mark, Calum and Ian, had worked together on many occasions. Their task this time was to carry on the refurbishment of the accommodation. They certainly worked very hard in what was to be a week of warm sunny weather. No TV or radio distractions, no internet but also no electricity, no fridge and no shower! Hmm! We would just have to smell for a week! 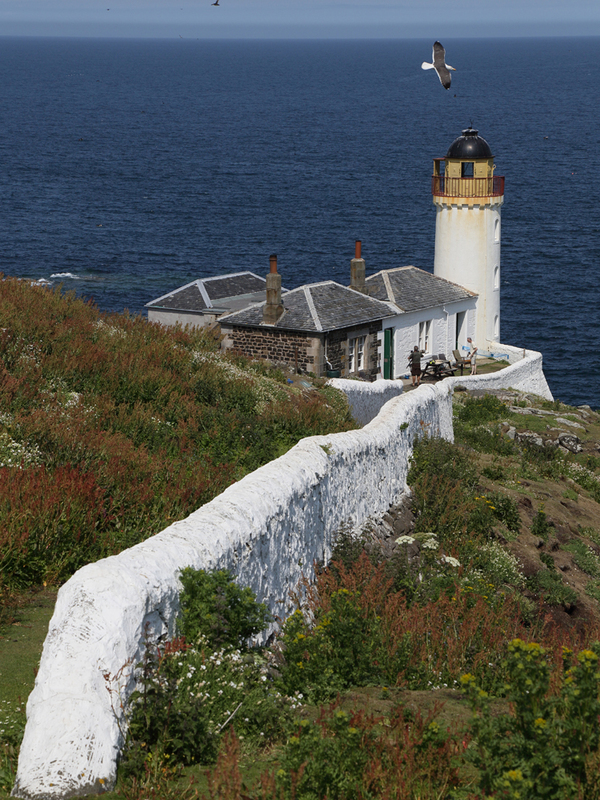 Brief history - The Isle of May was a major hazard to shipping in the firth of Forth so there have been several lighthouses and foghorns. There is only one light now, the Main light at the top of the island. The South Foghorn. . . Oh, and Dave! 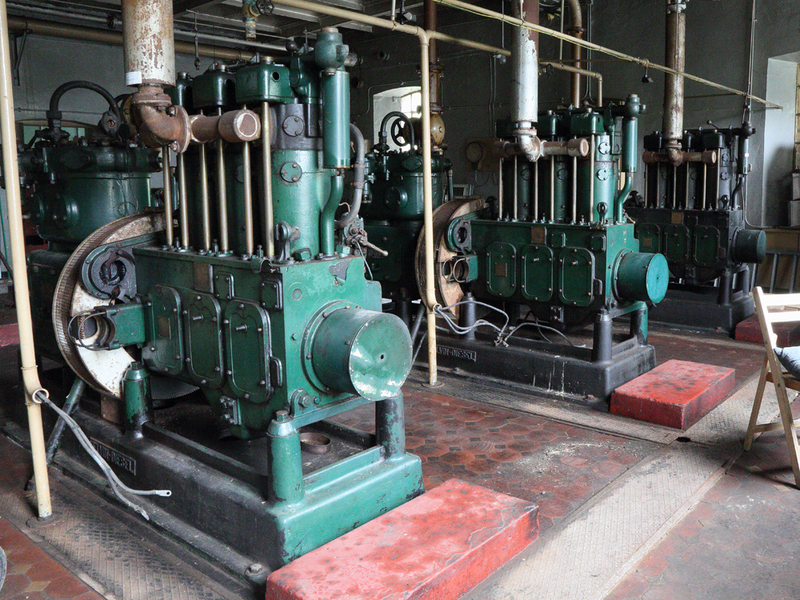 Compressed air pump room, now disused. The loch by the pumping station, with the main light upper right. 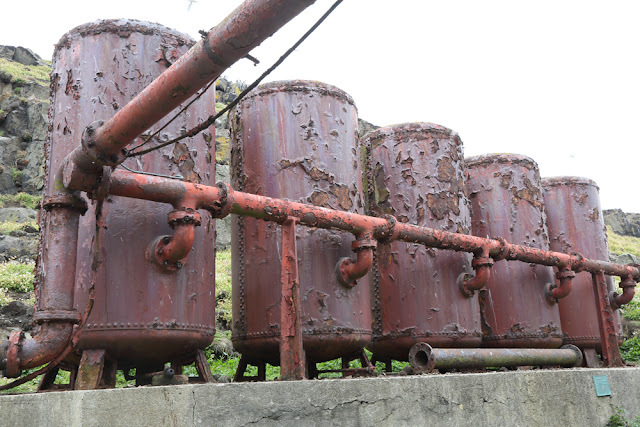 Large pipes (about 12-14cm in diameter) carried the compressed air the whole length of the island to the two foghorns. 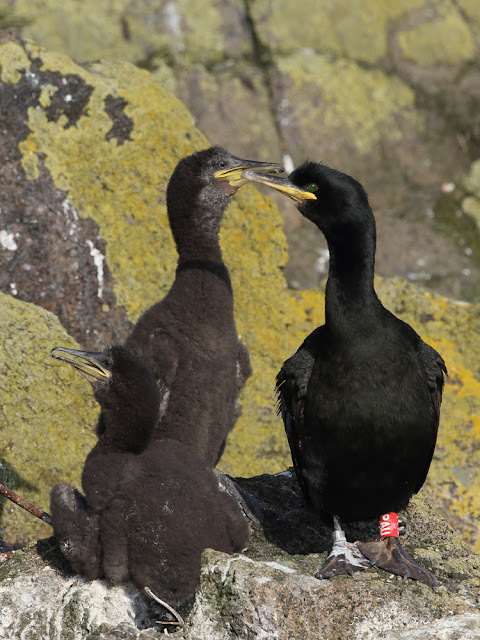 The Isle of May is a major seabird breeding colony. 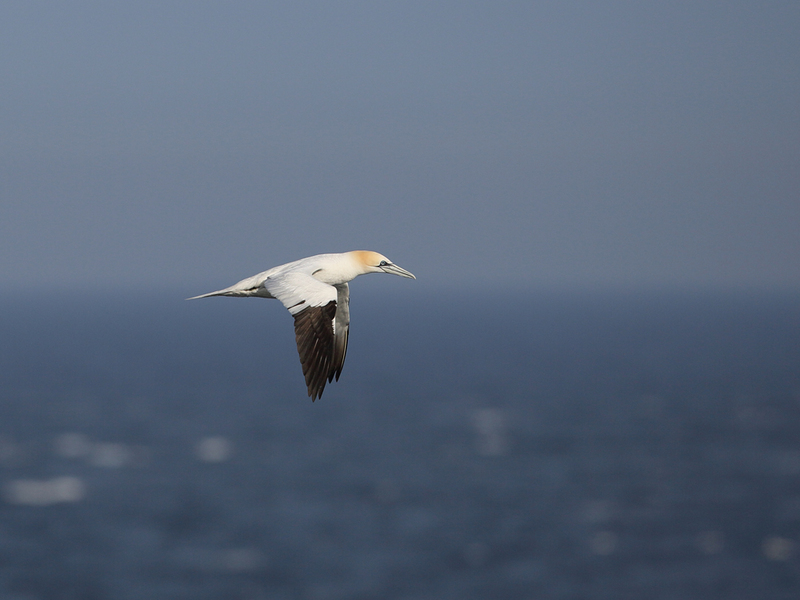 It boasts most of the common seabirds except gannets, which are concentrated on Bass Rock about 10 Km to the south. 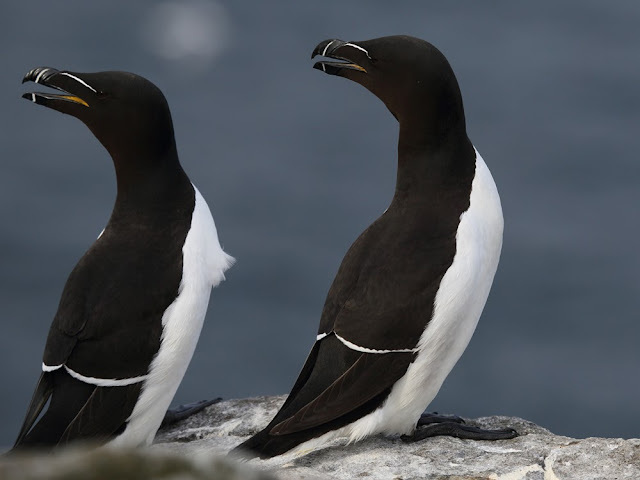 Approximate numbers are c. 46,000 pairs of puffins, 15,000 pairs of guillemots, 3,000 pairs of razorbills, c.1,000 pairs of shags, the same for eider, 2,500 pairs of kittiwakes, 5,000 pairs of herring/lesser black-backed gulls, 40 pairs of great black-backed gulls, several hundred pairs of arctic/common terns and c. 300 pairs of fulmars. This makes roughly 150,000 breeding birds. 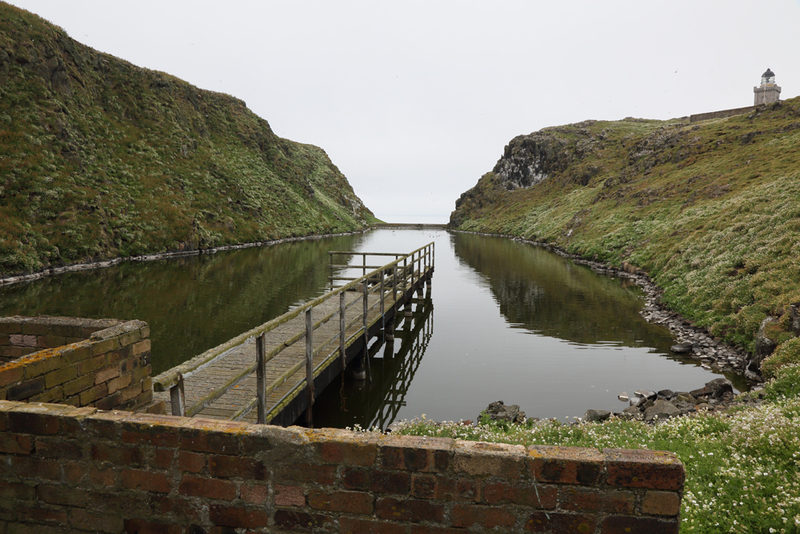 All areas of the island are either riddled with puffin burrows or colonised by other species. The constant sound of seabirds calling was spectacular and it is no exaggeration to say that this cacophony never stopped; not even at night! I was cool with that. 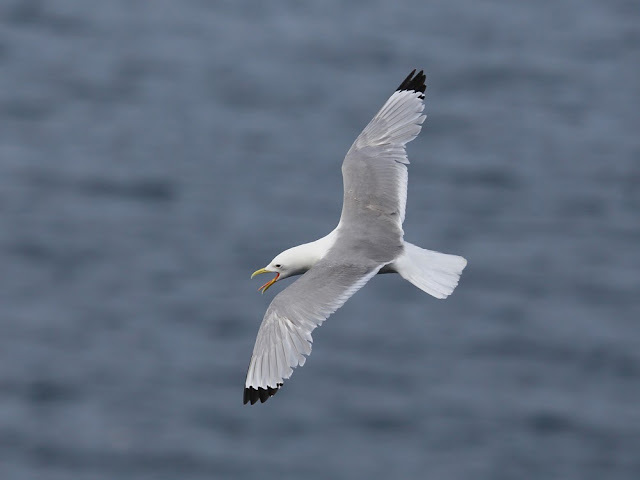 I was brought up in Plymouth on the South Devon coast and my abiding childhood sound memory is the call of herring gulls. With relatively few species to photograph, we could take our time and work out how to get the best angles, etc. Despite our best plans, we still didn't get 'perfect' shots of all the birds, but it was fun trying. Arctic terns - These aggressive terns were great. They nested very close to the paths so they attacked everyone who walked along them. They brought sand eels to their single chicks one at a time. However, both parents helped, so the chicks were well-fed. Chicks wandered around on the path where they were sometimes picked off by gulls. It was really sad to see a chick taken off after all the hard work the parents put in. The video shows an adult flying in with a sand eel to feed her hungry chick. Despite the many terns calling all around, the chick instantly recognises the call of her parent and gets ready for the meal! Eider ducks - They had largely finished breeding by July but there were several females still around. 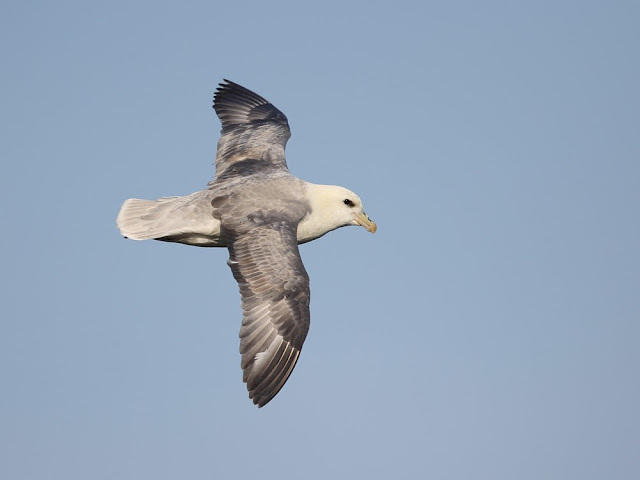 Fulmars - These look like gulls but they are actually related to albatrosses. 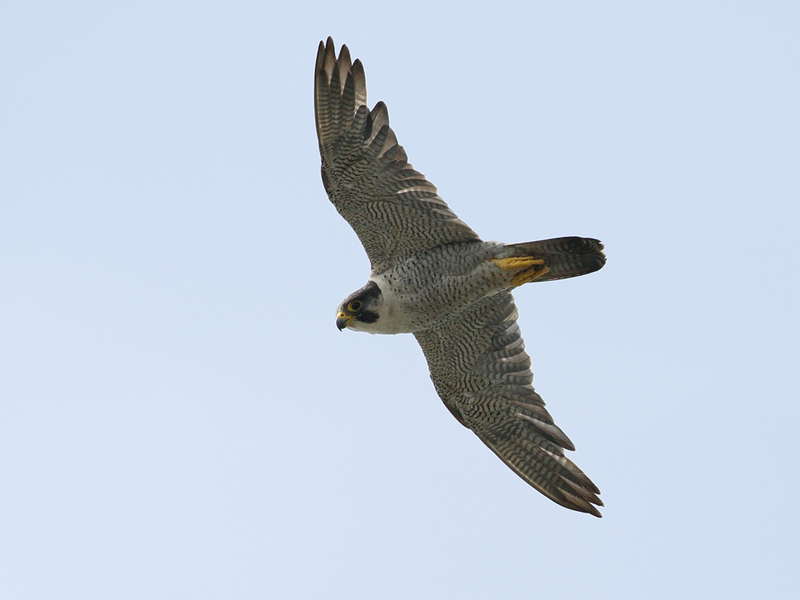 They soar expertly along the cliffs, using the updraft. 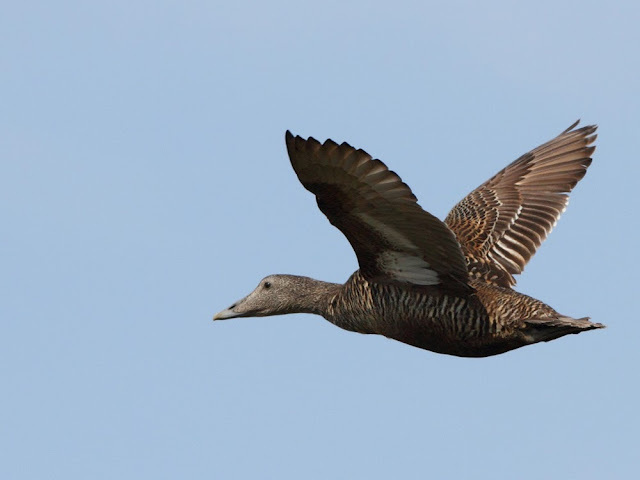 They nest on the island, often just a few metres from the paths. 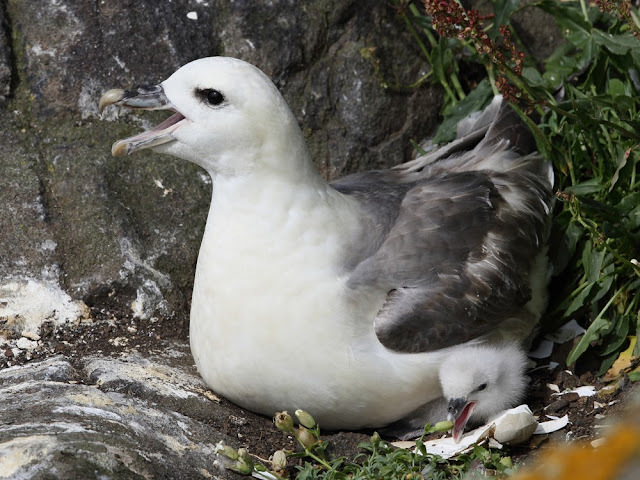 Fulmar with chick. Note the tube on top of the bill to expel salt. 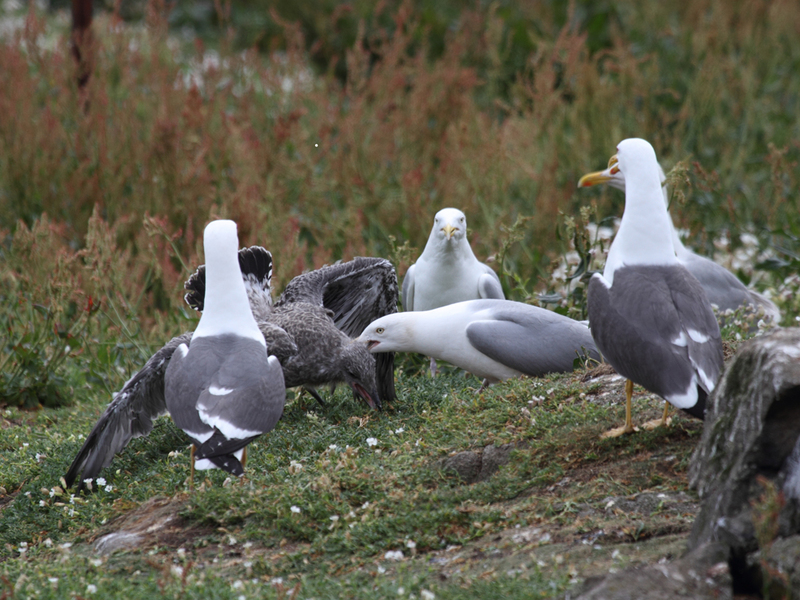 Great Black-backed gulls - are easy to love and hate. They are huge majestic birds but they will eat almost anything. 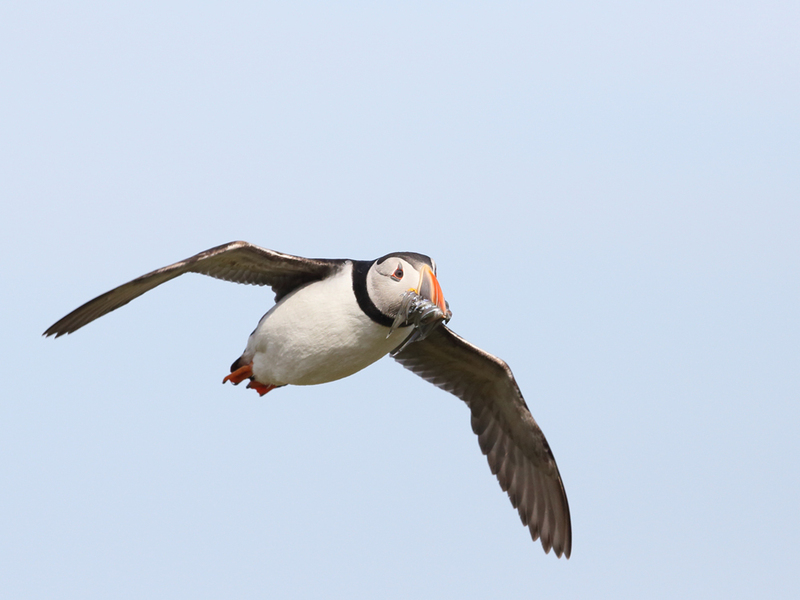 One of the long-term volunteer workers said he saw one take an adult puffin! 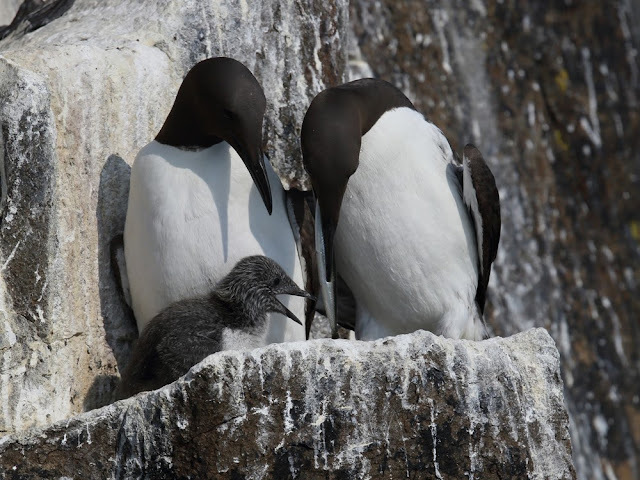 Guillemots - are quite numerous on the island. Members of the auk family (like razorbills and puffins) they have quite small wings and you wonder how they ever manage to fly. 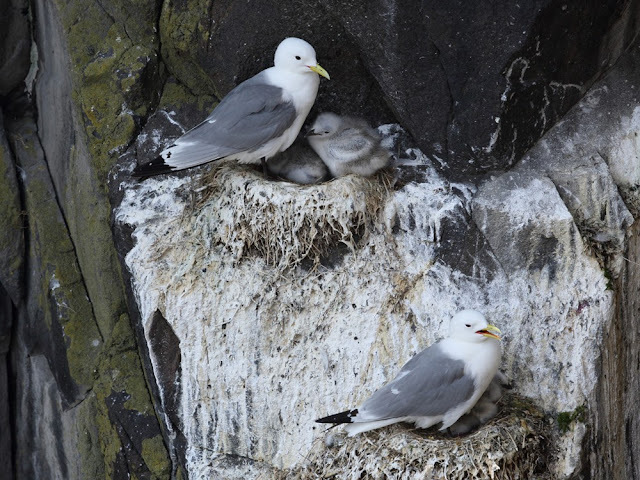 They nest on a bare rocky ledge on the cliff face with no nest as such. The chicks looks extremely precarious most of the time. 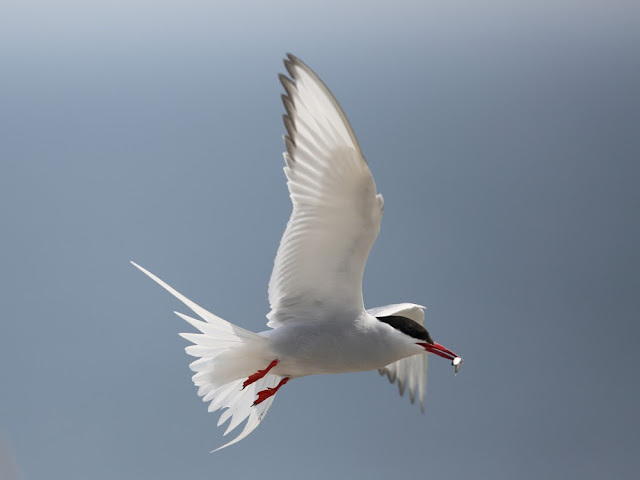 Adults bring in larger fish than the sand eels favoured by puffins and terns. Guillemots. Dad brings in a fish, which quickly disappeared! 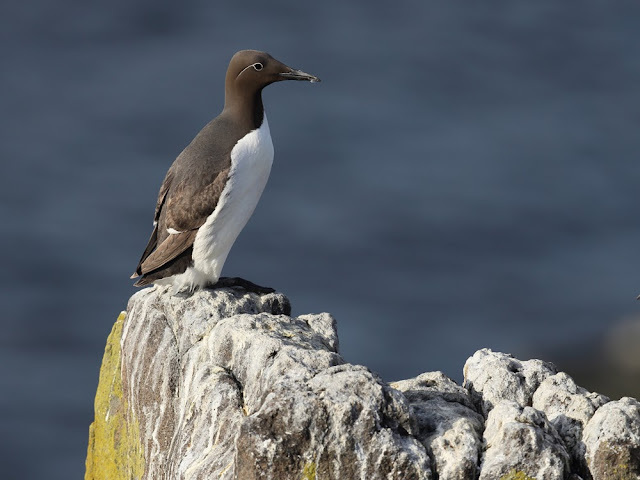 Guillemot. 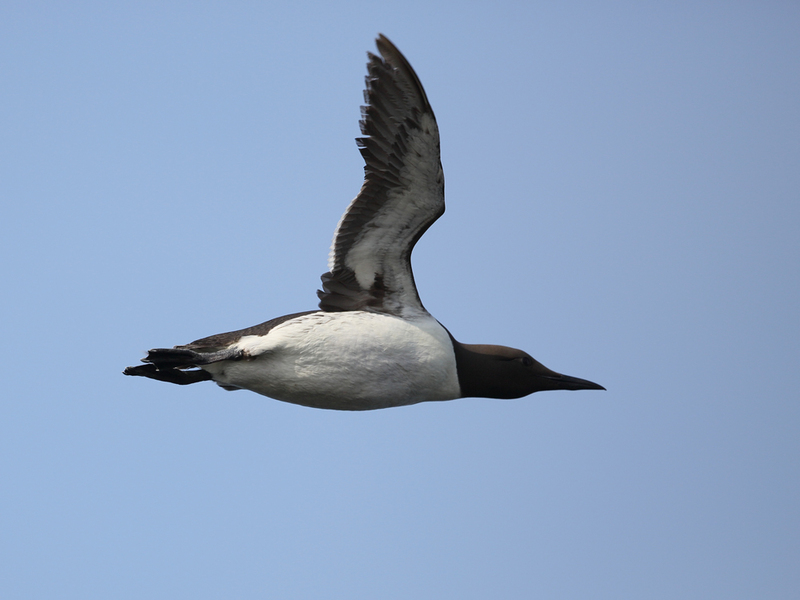 This is a 'bridled guillemot' on account of the spectacle markings round the eye. Kittiwakes - These lovely gulls are noisy and their call is very like them calling their name. They nest on a tiny ledge on the cliffs but at least they make a nest. They may have one or two chicks. Lesser black-backed gulls / Herring gulls - These gulls usually nest on the ground and do so in mixed colonies. Sometimes they have two or three chicks. Each bird has it's own territory and woe betide any bird, or nearby chick, who invades it. They will be attacked mercilessly. The large chick in the video below did eventually pull free. 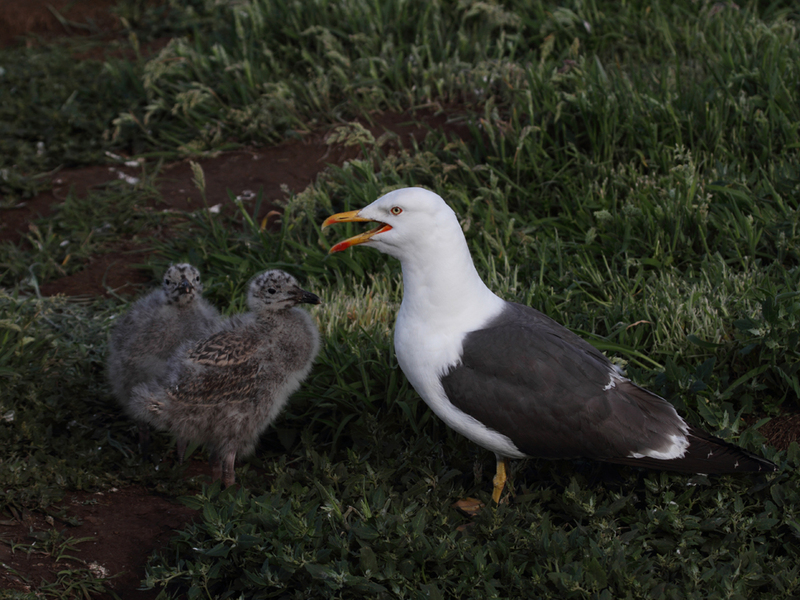 Lesser black-backed gull with her two chicks. No nest. Eggs just laid on the grass. This lesser black-backed gull chick strayed into the territory of a herring gull. He won't do that again! Puffins - What can I say about puffins? 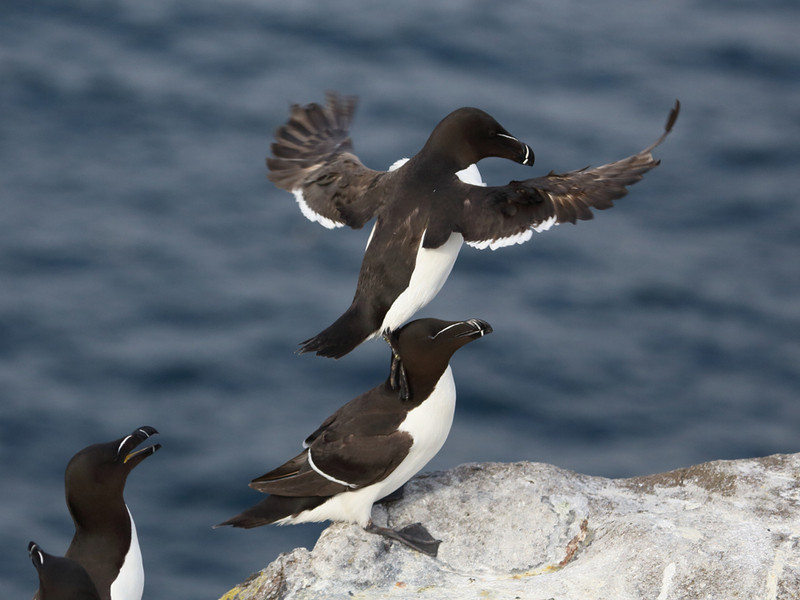 They are the iconic auks who nest in burrows underground to keep their chicks safe until they are big enough not to be picked off by the gulls. 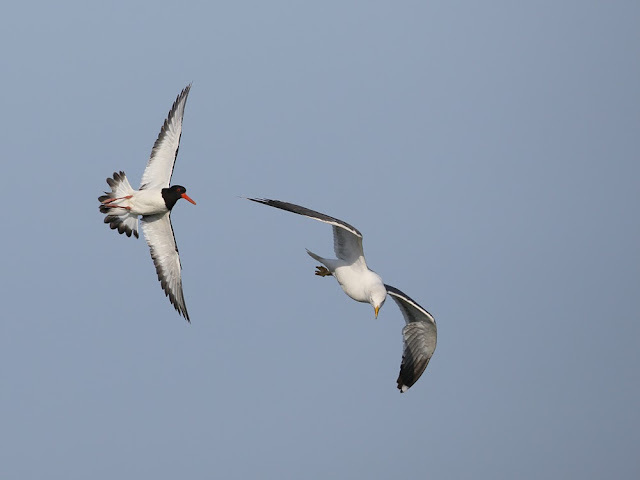 Whereas terns bring in sand eels one at a time, puffins bring in a whole billfull of eels. Their bills have special hooks to keep the eels tidy. Sometimes they catch bigger fish. 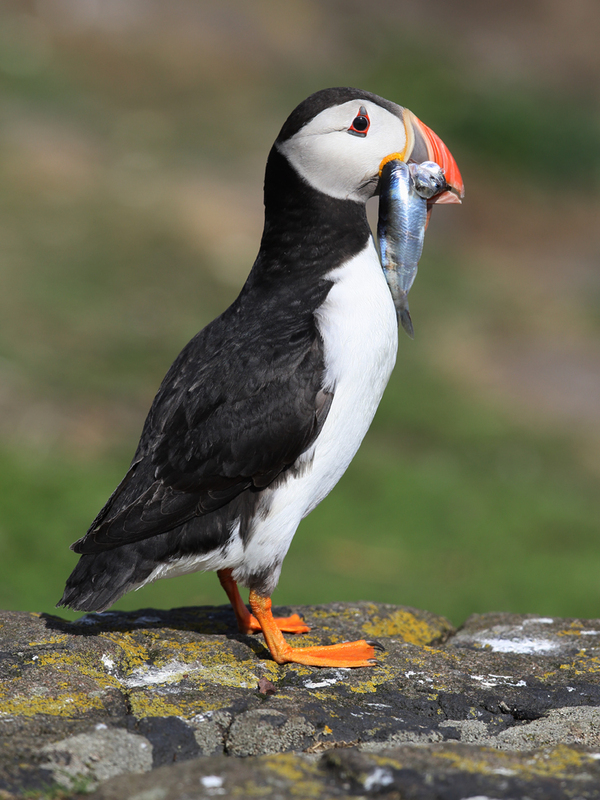 Puffin with larger fish than normal. 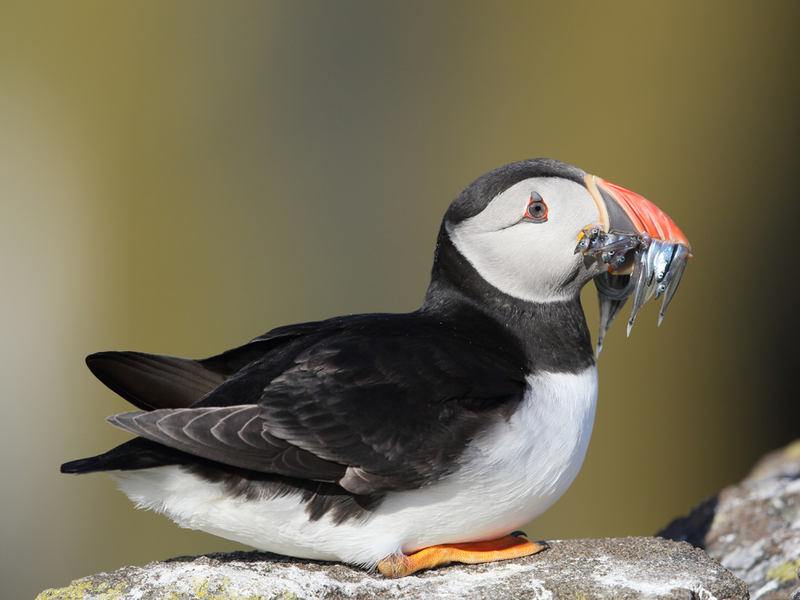 Puffins often sit around on rocks with a bill full of eels before going to their burrows. Puffins are hardy birds. 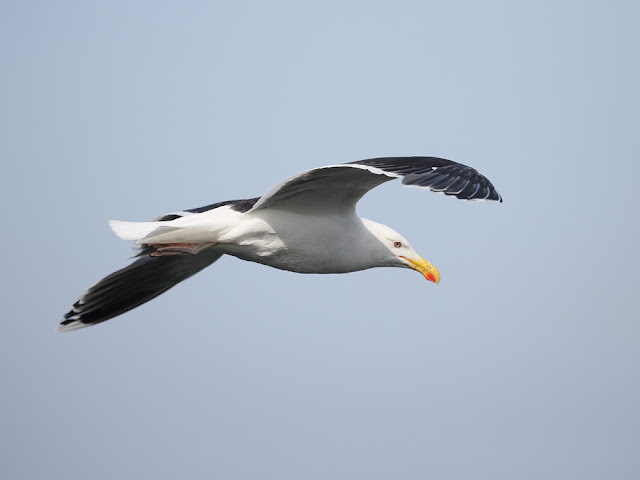 They have to be, because they often get ambushed by gulls as they fly in and approach their burrows. They are sometimes lucky to get into their burrows with just a few eels! I suppose the gulls do have to feed their own chicks! 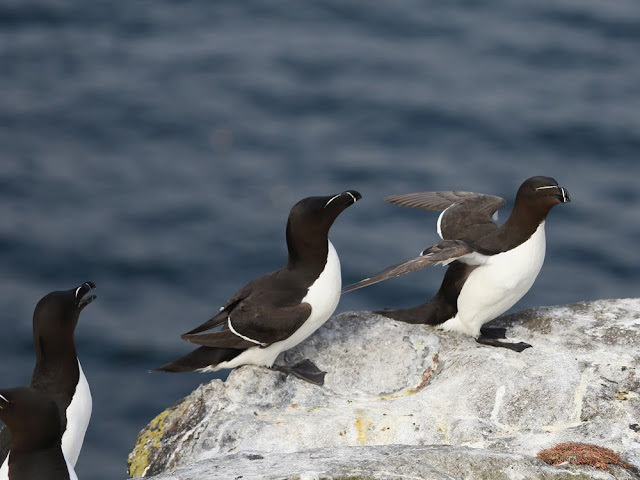 Razorbills - Razorbills usually have only one chick. 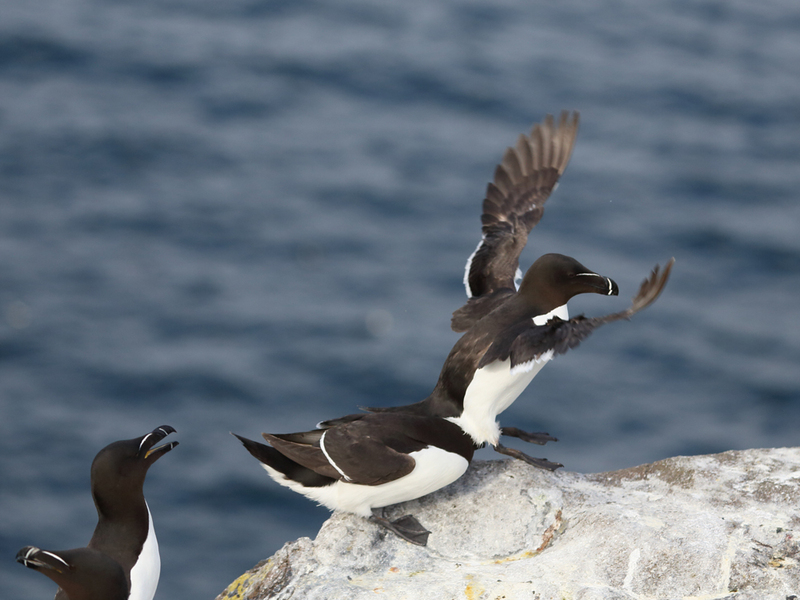 Sometimes I think I like razorbills more than puffins. Look out! I'm coming in to land! Oops! Sorry! Just have to sit on your head! Shags - are slightly smaller than cormorants. They look very similar. Their young get very big quite quickly. You get away from my territory! Near the edge of the cliff taking pictures of the birds as they fly past. While Dave and I went out photographing birds, Mark, Calum and Ian were slaving under the hot sun all day. They did a fantastic job building a magnificent stone wall, a made-to-measure bookcase and broke up great slabs of the local greenstone to make a patio for occupants of the Low Light. Well done guys! You were great. Occasionally, Mark would turn on a portable generator to run the electrical tools. That was the only time we had electricity to recharge our batteries, etc. We certainly ate well at the Low Light. First breakfast was cereal and tea. Second breakfast was a full English, but I usually had a poached egg in a bap with a slice of bacon. Lunch was mainly cheese and wine with dips and things. Very civilised! Dinner was a substantial meal which Ian or Dave prepared, with plenty of wine and beer. On Wednesday, Andy and Jacquie arrived from Edinburgh for two nights. They brought a lovely venison stew with them. By Thursday, Dave and I were thinking that there were only so many photos one can take of cute puffins with their bills full of sand eels! However, my train was booked for 17.30 on Saturday so we had to stay the full week. 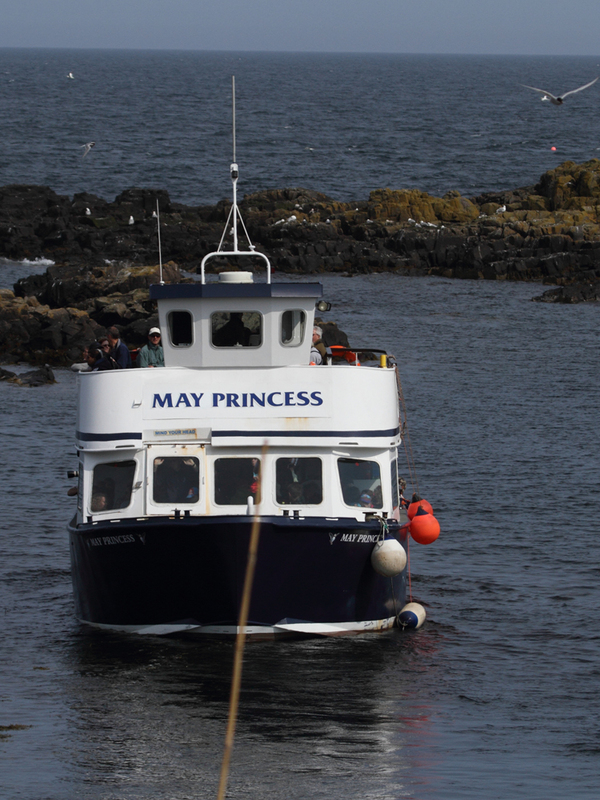 The weather was so good that the May Princess came in most days with a full load of 100 day-trippers. They stayed for about 3 hours while the tide reached its lowest and then rose enough for the boat to enter the harbour at Anstruther again. Sailings were very tide dependant. The May Princess came later and later each day as the tides changed. On Friday, Mark announced that we would be leaving the island at about 3pm on Saturday because of the tides. Bearing in mind the crossing time, the need to get and pack the car, followed by the journey to Edinburgh, I realised that there was no way I would be able to get my train! Fortunately, Andy and Jacquie came to my rescue. They were leaving at 6pm on Friday and offered to let me stay with them in Edinburgh so I could get my train the next day. This was a perfect solution. Not only would I get my train but I would be able to have a shower and look round Edinburgh beforehand! Dave decided to come with us to Anstruther and drive straight back to North Wales. I'll do another post about my wanderings round the lovely city that is Edinburgh. 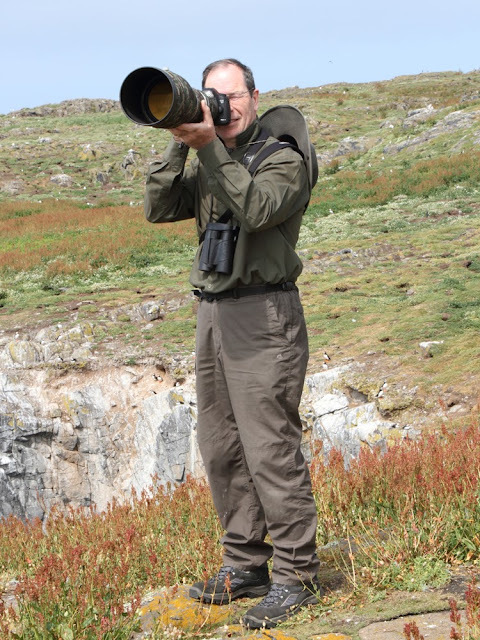 very interesting blog Phil- I would love to share your missed timed landing of the Razorbill with friends on my facebook site - duely acknowledged of course...would that be okay? Thanks Corinna. Yes, you may use the razorbills of course. best wishes, Phil.